RSchip. Experience the new performance of your car. We made a new application as simple as possible and functional at the same time. All settings are now in a separate section. Do you want to return the car to the factory settings to feel better difference in the dynamics? Now this function is secured to a separate button. The delivery was very fast. I installed it on my own. The step-by-step installation is very straight forward and clear. It took the RSchip only 4 minutes to calibrate. This resulted in much smoother and more responsive operation of my automatic transmission. It works as if it was manual transmission. The acceleration was quick, and throttle response was at its best. When I turned on “Sport mode” the acceleration was even higher, which makes me much happier! I anticipate that my fuel consumption will eventually drop. So far it’s 10.6 L/100 km and in the rural area with straight clear road it’s 8.4L/100km with speed of 110km/h. A special thanks to developers. 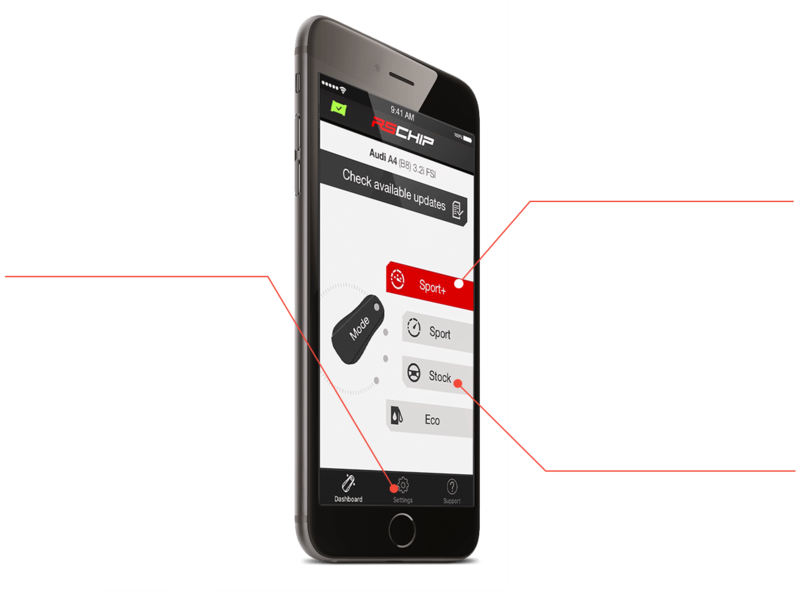 I personally recommend RSchip for everybody who drives same car with automatic gear box. It’s time to put your car out of sleep mode! Before the RSchip installation, I’ve been made to use Power button, to increase performance and drivability. Now the drivability has become even better than it used to be with the Power button on! . My automatic gearbox works smoothly, no lagging at all! It really works! I haven’t tested my fuel consumption yet, will see how it plays out. Unfortunately there is no expert evaluation to prove HP and Torque gain, the only garage I can go to is quite far away from where I am now. Many people still skeptical about it. To be honest I don’t believe in magic, but after short period of time, I realized this device does work! I wired this box called RSchip, I don’t know what other are thinking, but I felt the change. My car performs better at the lower RPMs. Towing and gear shifting have also been improved. Fuel consumption has dropped by 1 litter. I drive Subaru Tribeca and I was very reluctant to overwrite the ECU, chip tuning by the RSchip seems to me as a very appropriate alternative. Weather to buy it or not is only for you to decide. Two of my friends, both drive Toyota bought the RSchip following my recommendations. I have been driving a Kia Ceed 1.6 diesel since 2007. I have travelled 175,000 km. I have no complaints about my car. It takes 11.5 second to reach 100 km/h with maximum speed of 200 and it doesn’t consume much fuel. The city driving cycle is 5-5.5 l/100km. When the time came and my son got older, he started slowly talking me into boosting the performance of our vehicle. We decided to do OBD tuning. We called almost every local car workshop, but they all seemed to be kind of sketchy. The greater number of OBD tuners were eager to tune my car’s engine even though they mentioned that they didn’t have much experience in the tuning of diesel engines. One more obstacle for me was their working hours. They don’t work at the weekends, and during the week I’m always busy at work. So that is how I started my search for an alternative to OBD tuning, without actually overwriting ECU. I don’t know how I decided in favor of RS tuning-boxes. After I’d received and installed this device by myself, I drove around 150 km. When we gauged the acceleration again, I was utterly surprised. Now it takes 10.3 seconds to reach 100 km/h. and after 850 km only 9.7 seconds. My son is very happy with the result. The fuel consumption remains the same. Everything is fine so far. Many thanks to developers and manufacturers for giving an opportunity to stand out against a background of a dull car flow. My car has a big a big appetite! My friends told me to buy the RSchip. I was very reluctant to believe, that this box, could somehow help me. I was given 14 days to decide, with money back guarantee. After 6 days I’ve noticed my fuel consumption declined by 2 litters. During that time I drove 420 km. Very impressive! I ordered two boxes, one for my car and second for my son’s car. By ordering two units I got a really good discount. That was a pleasant surprise. Right before my car trip, I installed the RSchip on my Opel Vectra C 2.2, 2003 with manual transmission and 195 thousand kilometers. The average fuel consumption was something around 6.6-6.7 liters per 100 km. There were only two people in the car, the trunk was empty and there were also couple of things on the backseat. When we were half way to our final destination, I felt a significant power increase in the lower RMP range. The interesting thing is, on our way back home the car was loaded, however the fuel usage remained almost the same as it had been with the empty car. Before the installation of the RSchip I had different figures of about 7.6-7.8 per 100 km. But the main thing I would like to point out is the greater towing in the lower RPMs. Earlier, when I wanted to outrace somebody, I was required to upshift to the 4th gear. Now there is no need for that. The car accelerates much faster. To my mind my car has become much more responsive and smoother. All in all, I can say I’m satisfied. IMHO: I don’t want to contemplate whether the device pays for itself by saving on fuel as it’s a really stupid idea. The advantage which I more concerned with is increased towing effect across lower RMP range. Respect to developers and manufacturers of this device. I hesitated for a long time whether to buy the RSchip. I finally dared to try. I wired it up and calibrate according to the manual. I felt it immediately! Smoother acceleration and greater towing, which takes place at about 2700 rpm, before it was only at the range of 3500 rpm. After a little more than 100 km the chip stopped working. I pulled over, turned off the engine and pulled out the chip and put it on standby mode ( red LED flashes ). After one minute I powered up my car and everything appeared to be working again. I haven’t gauged my fuel usage yet. I will continue testing the RSchip and share my experience with you. I’ve been told about the RSchip by my friends and made up my mind to order it at my own peril. The package was delivered in a short time. The installation was quick and easy. A manual is very well written and provide comprehensive set-be-step guidance. My Opel became more responsive at the lower rpm-range with no throttle delay. I don’t pay any attention to km per litter. The purchase definitely lived up to my expectation. Thank you RSchip team! I’ve been waiting for a proper power box for a very long time, because it’s really impossible to find something like that for Toyota Land Cruiser with petrol engine. After installation, I was warned that it takes about 200km to feel the full gains of the chip. After that, I really felt a significant change! It delivers smoother, and more responsive performance, especially in the low and medium rpm ranges. Guys, it's a real deal! I called electrical technician this morning, to have it installed to my car. It took him about 15 minutes, to set everything up. It came to my attention, that my car is no longer mine! Even before my Acura with 236 HP engine was soaring. Throttle delay has disappeared, and it behaves better, more like car should. I have nothing yet to say about fuel economy, I drove only 100 km. Really good thing! I can’t say anything against the RSchip. Monday – Friday 08:00 a.m. - 05:30 p.m.